The industry experts are likely to talk about decreasing profits and issues surrounding H-1B visas. Prime Minister Narendra Modi is scheduled to meet tech and other industry CEOs on June 25, a day before he meets Trump. Reportedly, the industry leaders might discuss sticky issues including H-1B and climate change. The meeting will take place at Willard Intercontinental Hotel in Washington, DC, the Moneycontrol reported. The meeting will begin at 11 a.m. and about 19 CEOs will be meeting the Indian prime minister. Among attendees are: Amazon founder and CEO Jeff Bezos, American Tower Corporation Chairman Jim Taiclet, Apple CEO Tim Cook, Adobe Chairman and CEO Shantanu Narayen, Caterpillar CEO Jim Umpleby, Google CEO Sundar Pichai, Lockheed Martin Chairman Marillyn A Hewson, Microsoft CEO Satya Nadella, Walmart President and CEO Doug McMillon, Warburg Pincus co-CEO Charles Kaye, Cisco Executive Chairman John Chambers, and Deloitte Global CEO Punit Renjen. In an hour-and-a-half long meeting, the CEOs are likely to convey their concerns regarding the anxieties surrounding the works visas and plummeting profits. Some other CEOs attending the meeting include Emerson Chairman and CEO David Farr, EY CEO Mark Weinberger, Johnson & Johnson CEO Alex Gorsky, Marriott International President and CEO Arne Sorenson, Mastercard President and CEO Ajay Banga, Mondelez Chairman and CEO Irene Rosenfeld, and The Carlyle Group co-Founder and co-CEO David Rubenstein. On his part, Modi is expected to highlight achievements of his government, especially the much touted Digital India campaign. The report said that he might refer to demonetization and his efforts to eliminate the black money in India. Modi’s visit comes at a time when not much is being expected to roll out. Apparently, this meeting is viewed as a part of break-the-ice efforts between the two world leaders. So far, Trump has not given a very positive response to India. 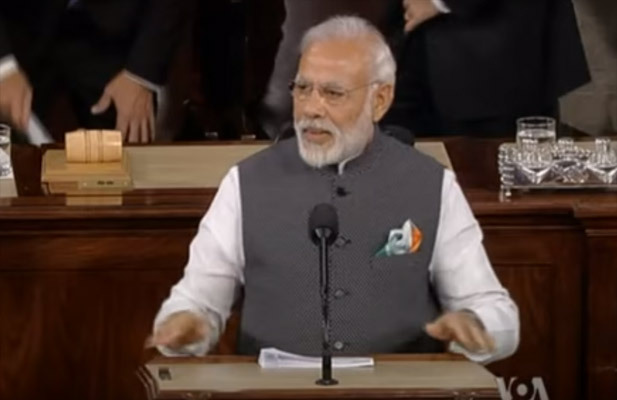 His recent comment that India is gulping “billions and billions and billions of dollars” on the name of Climate Change aid indicated that India might have to make more efforts to understand and befriend the new administration in Washington, DC.